You can use Microsoft Outlook with many email accounts. Most Email providers such as Google’s Gmail, Microsoft’s Hotmail and many other providers provide free POP and SMTP access which allows you to use and integrate all your Email Accounts using Microsoft’s Outlook Express. The only exception is Yahoo’s Yahoo! Mail. In this day and age it is really unfortunate that Yahoo does not provide free POP and STMP access to the users of its free Yahoo! mail. Note: Yahoo does provide free POP and SMTP access to its premium Yahoo! Mail Plus which requires a paid subscription. If you are one of those who has a Yahoo! mail Plus account, scroll down to the bottom of this article on how you can access Yahoo! Mail using Microsoft Outlook. You need to download a small application called YPOPs. 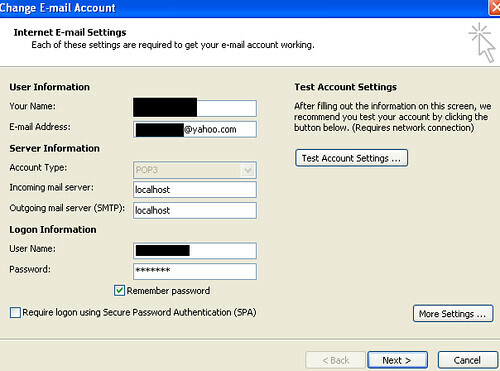 YPOPs is an application that provides POP3 and SMTP access to Yahoo! Mail. YPOPs acts as a gateway between Yahoo! Mail and Microsoft Outlook. For those who opted for the new Yahoo Mail beta are good too to use this to access Yahoo! mail using Outlook. Download YPOPs from SourceForge. When configuring YPOPs, while the default settings are pretty good, I like to customize them a bit. * In Receiving Email, under download Email Category, I choose to select just Unread email to download so that I won’t download all the hundreds of emails I have. * In Miscellaneous, it is good to check Automatically start YPOPs! when Windows starts so that you don’t have to worry about launching it everytime you launch Microsoft Outlook. NOTE: If you are using Microsoft Outlook 2010, go to Step 4 directly. Everyone else, please follow instructions below. 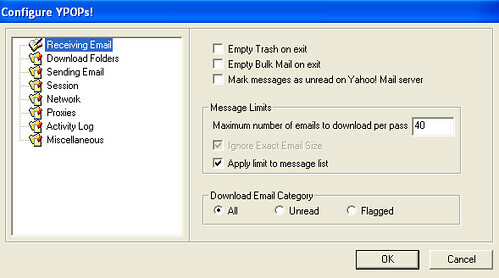 For Microsoft Outlook 2010, select IMAP from the drop down box above the incoming mail settings box. Posted in TechTips and tagged email, gmail, Microsoft Outlook, TechTips, Yahoo!. Bookmark the permalink.